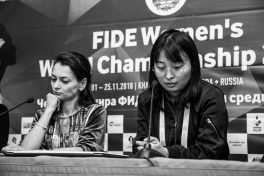 – Ju Wenjun, congratulations on qualifying for the final. 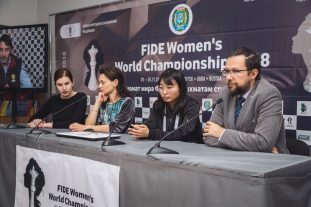 Please tell us about the semi-final games with Alexandra Kosteniuk. 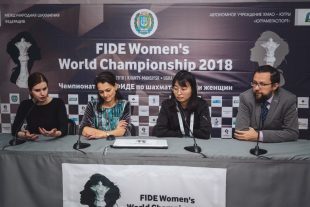 – The first game, where I had the black pieces, I played with the idea to avoid Alexandra’s preparation. 18… Nxa6 is a tricky move and after that Black is having a good advantage. Eventually I won the game. I had White in the second game, so it was easier to hold a draw. 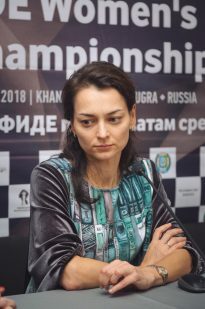 Alexandra Kosteniuk is a great chess player and she has a very good result against me in the previous games. I was really lucky to win and to qualify for the final. – Alexandra, what can you say about your performance here? Which match was the best one for you? – It’s quite difficult to analyze my play right after the tournament. I prefer to have some rest and then I will be analyzing my performance. 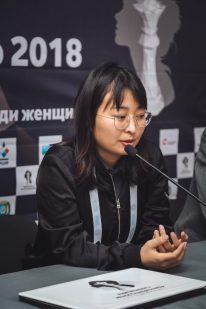 I had a very difficult pairings and very strong opponents. Naturally, when you get eliminated in the final, it is disappointing but, all in all, I’m quite happy with the result I showed here. – The same question goes to Ju Wenjun. Are you happy with your performance here so far? – I’m satisfied with my performance here. I’ve had no play-offs so far and I was able to have a good rest. Actually, this is my first time to qualify for the final and it’s really exciting for me. 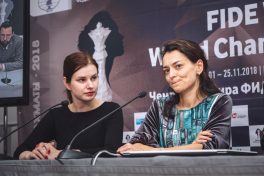 – In the final you will either play with Kateryna Lagno from Russia or Mariya Muzychuk from Ukraine. Which player is more, let’s say, convenient for you? – They are both very strong players. 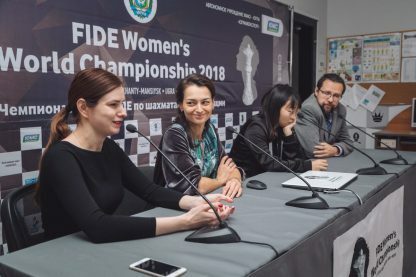 Muzychuk won the Women’s World Championship once and Lagno is a very experienced and talented player. I think both of them will be very difficult to play with. 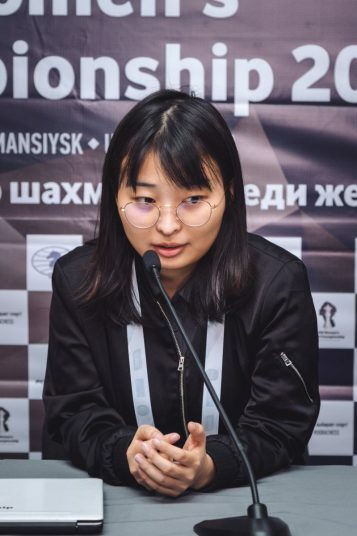 – Alexandra, we know that the Alexandra Kosteniuk Chess Cup among children is taking place quite soon. Could you tell us a couple of words about it? – Yes, the Cup starts tomorrow. It’s already the 11th edition of it. It will be taking place in Skolkovo, near Moscow. I will go there, but, unfortunately, I will miss the Opening Ceremony. But still I will visit the tournament and then I will return back to Khanty-Mansiysk to comment on the final. 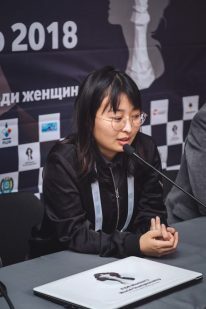 – Ju Wenjun, you didn’t play a single tie-break during this tournament which means that you had five extra days off. Do you consider it to be a kind of an advantage for you in the coming final? 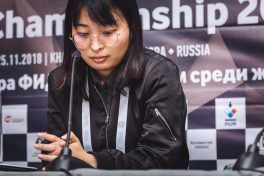 – I think a good rest with no play-offs helps me play games with classical time control. So far, I think it’s good to have rest.